There are artists who can work under the restrictions of a theme. There are some who prefer to muddle about and try to make sense of what happens. Well — it’s more complicated than that, but I am definitely one of the latter. Once some of my students and I went on a field trip to the studio of Neda al Hilali. To one of their questions she replied “My studio is the only place in the world where I can do whatever I want.” Bless her, and I ask “why would I want to dance to anyone else’s tune when I am in my own studio?” So when I read of a challenge to artists and poets from the University of Puget Sound in Tacoma, Washington concerning the U. N. International Year of the Soil, I surprised myself by responding. 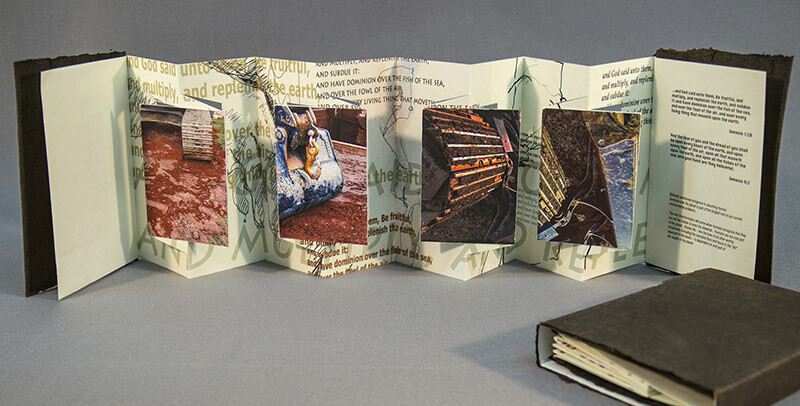 The results are two small books reflecting some of my understandings and feelings about soil, the “skin of the earth”. They are constructed with a modified concertina binding developed by Heidi Kyle. The first is How to Develop a Healthy Immune System. 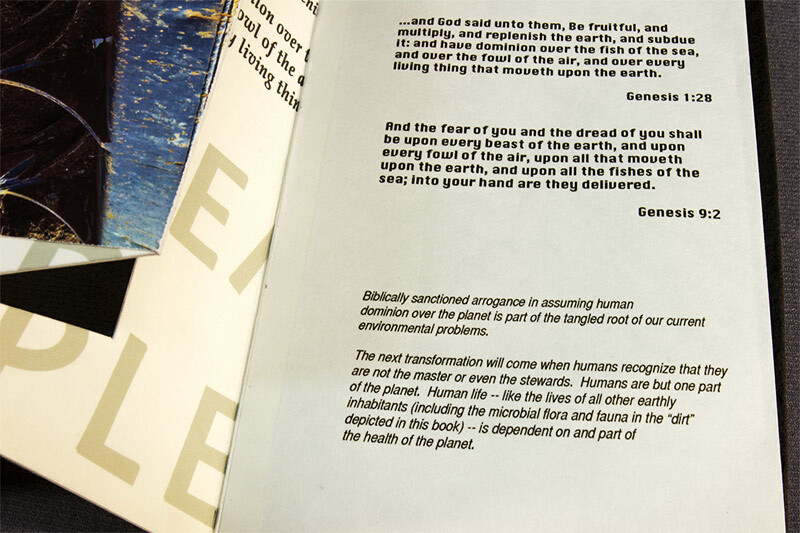 I’ll let the book speak for themselves. To read more easily, click on the picts to enlarge them. The second, How Soil Becomes Dirt, is based on something that has bothered me for many years. There is a lot of construction going on in my neighborhood. I am both fascinated and repelled by the huge machines and the crushing noise; by the stripped-bare tactics that seem to be part of the mentality of heavy construction, prisons, forestry — you know — the usual list. I took some picts and combined them with biblical quotations to make this. I was nervous about sending these out (because they break from my long established creative process). But I was very pleased to get a encouraging letter of acceptance from the jury. 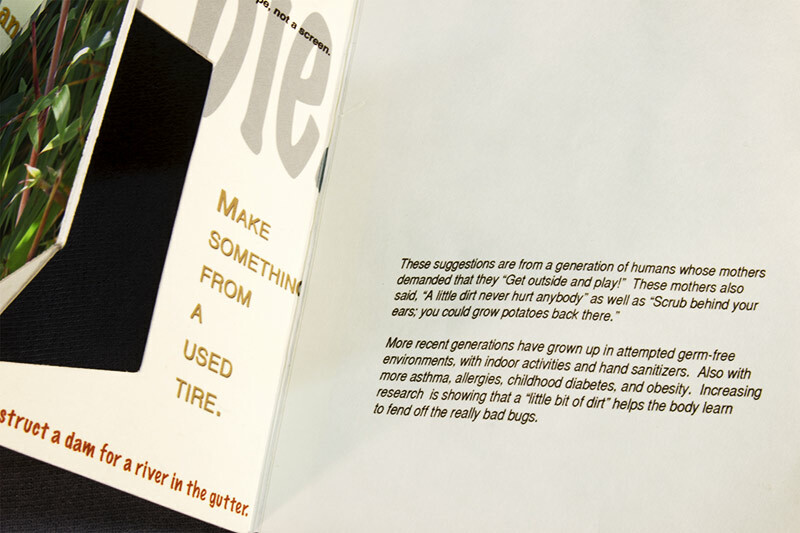 The books are included in the show “Dirt: Scientists, Artists and Writers Reflect on Soil and Our Environment” at the Collins Memorial Library of the University of Puget Sound. If you are in the area, please visit the show which will be up from August 6 to December 4.